Going into the Sunoco World Series Valenti Modified Racing series (VMRS) feature event Anthony Nocella of Woburn, MA was leading the 2017 championship race by 104 points over second place Canaan, NH driver Donnie Lashua. Nocella had double duty on Saturday -- qualifying the #92 NASCAR Whelen Modified (NWMT) and participating in the VMRS race is the family owned #92. 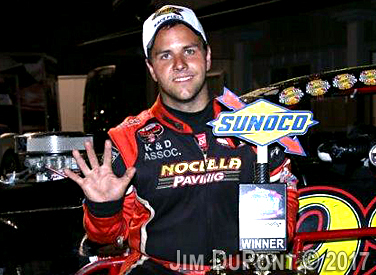 Nocella qualified and will start the NWMT 150 lap NWMT race twentieth. With a stout field of thirty VMRS modifieds on track for the initial green flag, competition was tough and the field was tight. Nocella began the VMRS 50 lap World Series event eleventh and was in the top ten by lap 6. He rode there in his comfort zone waiting for the right time to make a move. Incidents eliminated cars from the field and by lap 31 there were only fourteen cars left running. Nocella dodged the incident and had the front position by the end of the next lap. He went forward from there to claim a VMRS victory. Eric Goodale started on the pole, led the most laps in the first half of the race and finished the race second. Jeff Gallup started second, led some laps and finished fourth. Rowan Pennink began the feature deep in the field and cross the finish line third. Sam Rameau took fifth position at race end. Starting on the outside of row one on lap 31, Nocella had a strong car and it was time for him to make his move. “On that last restart I had a good opportunity and my tires were under me. I had a shot for the lead and I took it. I sailed the car in and did what I had to do to get to the front.” From there forward it was Nocella’s race to win. He was able to maintain a sizable lead to secure his fifth VMRS win. The VMRS banquet is schedule for December 2nd where the Nocella’s team will celebrate in style their first ever VMRS championship. When did you know you had what was needed to win the race?